Healing is more than a technical skill. It’s an art focusing on the whole person-mind, body, and spirit. That’s the philosophy of St. Vincent’s surgeon Dr. Susan Winchester. One advantage Dr. Winchester offers her breast care patients is the ability to perform diagnostic procedures in her office. She takes a more conservative approach to diagnosis, in sharp contract to more traditional approaches, which has favored removing any abnormality and then determining if it represents a malignancy. This means general anesthesia and invasive surgery, for which there is a longer recovery. “This ‘let’s-take-it-out-and-look-at-it’ method of diagnosis has contributed to the high cost of health care,” said Dr. Winchester, “especially when you consider that three out of four biopsies prove to be benign. This means that three out of four women are having needless surgery.” For women with a palpable mass, needle biopsy is the first option Dr. Winchester explores. This procedure uses a local anesthetic and a tiny incision over the mass. Tissue samples are extracted through a needle for analysis. Dr. Winchester also completes ultrasound-guided biopsies and cyst aspirations when the abnormality is best approached with ultrasound guidance. If the lesion is detected on ultrasound exam, a patient can have a biopsy on her first visit. Dr. Winchester also performs stereotactic biopsy in her office using the Intact(tm) Breast Lesion Excision System. In this procedure, mammography locates the abnormality. A computer than generates coordinates for the non-palpable abnormality. Then, a small probe is inserted to takes an "intact" sample of the abnormality. Though open breast biopsy - the more invasive approach - is still prevalent, Dr. Winchester’s results suggest that her conservative approaches are accurate. “Generally, we expect 15 to 20 percent of abnormalities detected by mammography to represent a malignancy,” she noted. Of 712 mammotests completed between 1989 and 1996, 108 were positive for cancer, or 15 percent. Of 368 ultrasound guided biopsies during that same period, 78 were positive, or 21 percent. 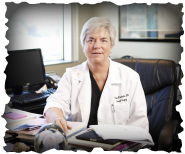 Dr. Winchester has the hands of a skilled surgeon, trained to perform delicate surgical procedures. But skilled hands and rigorous training are just a fraction of what makes Dr. Susan Winchester a physician. Her most remarkable distinction is a healing spirit.